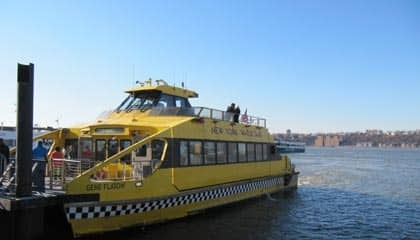 The New York Harbour Hop on Hop off Cruise is a great way to see the sites of New York. You could choose to hop on and hop off at a number of stops or just sit back and enjoy a 1,5 hour ride on the Hudson River. On board the professional guide will tell you all about the landmarks of New York that you’ll see: the Empire State Building, One World Trade Center, Statue of Liberty, Battery Park, Wall Street, DUMBO, Brooklyn Bridge Park and the Intrepid Sea, Air and Space Museum. Board the Hop on Hop off cruise at Pier 79 in Manhattan. Whether you sit inside the climate-controlled cabin, or head upstairs to the top deck you are guaranteed amazing views. Snap photographs of the Brooklyn Bridge, Ellis Island and the Statue of Liberty! If you want to explore some of the attractions, all you need do is hop off at any one of the designated stops. For example get off at Pier 1 to enjoy the Brooklyn Bridge Park – a perfect place for a picnic, weather permitting of course! Or hop off at Pier 11 and explore Wall Street and Financial District. Alternatively, if you just want to sit back and relax you can buy a variety of food and drinks on board. The New York Harbour Hop on Hop off Cruise is a perfect way to explore Lower Manhattan at your own leisure. Are you planning to explore Downtown Manhattan? Why not upgrade your Hop on Hop off Cruise to include entrance to One World Observatory. This will save you a lot of time and hassle. After the cruise, head to One World Trade Center and take the impressive elevator up to the 101st floor. Admire the highlights of Downtown Manhattan that you just saw from the water! After purchasing, you will receive a voucher that you can print out and use as your ticket for the boat tour.